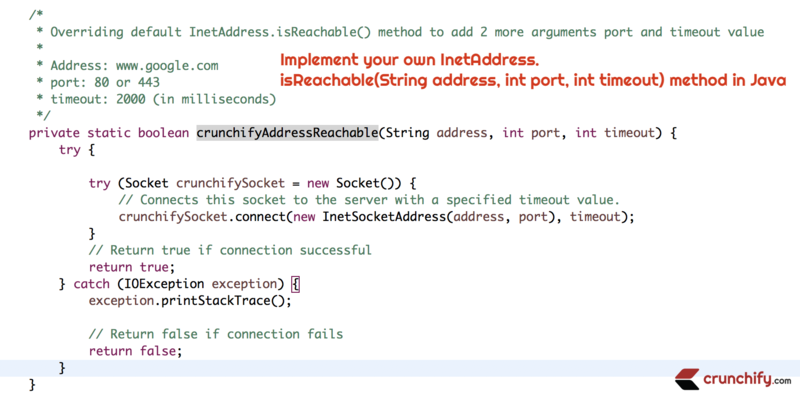 How to Implement your own InetAddress.isReachable(String address, int port, int timeout) method in Java? In Java there are multiple ways to check ping and port check. You could use system default’s ping command, Java’s native method InetAddress utility, HttpURLConnection and some more. In production or your testing environment, if you want to perform multiple port checks let’s say hundreds of checks at the same time then sometimes InetAddress.isReachable() method is not getting correct response. Infect in my case, I noticed 100% failure while trying to connect to www.google.com. Do you have any of below questions? java – Why does InetAddress.isReachable return false, when I can ping the IP address? How to check if I have an internet connection? How to test if a remote system is reachable? We will create 2 methods pingCheckbyInetAddressisReachable() and pingCheckbyCrunchifyisReachable() in which we will perform above 2 different tests. What method are we using crunchifyAddressReachable()? We are using java.net.Socket in our implementation. Socket class implements client sockets. With the help of connect() utility we are getting 100% of the time correct result. Kindly take a look at below code for more details. * Problem: Sometimes InetAddress.isReachable() gives false result. We have implemented the same Reachable check using Socket. It works almost 100% of the time. Comparison added. // Connects this socket to the server with a specified timeout value. Once you copy code over to Eclipse environment, just run as Java Application to see below result. How to generate Simple Timeout Exception in Java?